Google’s VP of Agency and Media Solutions, Tara Walpert Levy, spells out how the bar for relevant, attention-worthy ads is rising, along with consumer expectations—and what Google is doing to help. Google/Ipsos, Video Mobile Diary, U.S., 2017, n of 4,381 (saw ads occasions). Think about that for a second. That indicates a pretty striking difference between relevant ads and, well, average ads. It also says something about what “relevance” means for today’s consumer. It's no longer enough to simply know your audience. Today, advertisers must also know what their audience is looking for and in what context. Understanding your audience’s intent and being able to respond to that intent is becoming table stakes. The right message, creative, and ad format are key to successfully grabbing a consumer’s attention. That’s a pretty big opportunity for brands. At Google, our aim is to help brands raise the bar for the average video ad by finding ways to easily make ads hyper-relevant. Creating helpful advertising means anticipating your consumers’ needs, but that requires knowing what they’re in the market for. That’s where intent signals come in. Intent signals go beyond an audience’s identity or context to reach someone based on their intent: what they want, what they’re in the market for, and what they need at any particular time. Meeting someone’s intention is what has made search so powerful for so long—the ability to quickly help someone with what they want or need in the moment. Taking intent signals from not just search, but maps and apps too, creates a fuller picture of intent, which makes targeting even more powerful. Here’s how intent signals can drive relevancy and attention: Let’s take the example of someone interested in buying a winter coat. To date, if you wanted to target video ads for winter coats, you could guess a demographic that might be more likely to buy winter coats (say, women 18 to 34) or use psychographics to target people who might be particularly into preparing for winter (say, ski enthusiasts). Intent signals eliminate that guesswork. You can serve ads to people who searched for winter coat deals, spent a lot of time scouting nearby ski resorts, or scrolled through coats in a shopping app. 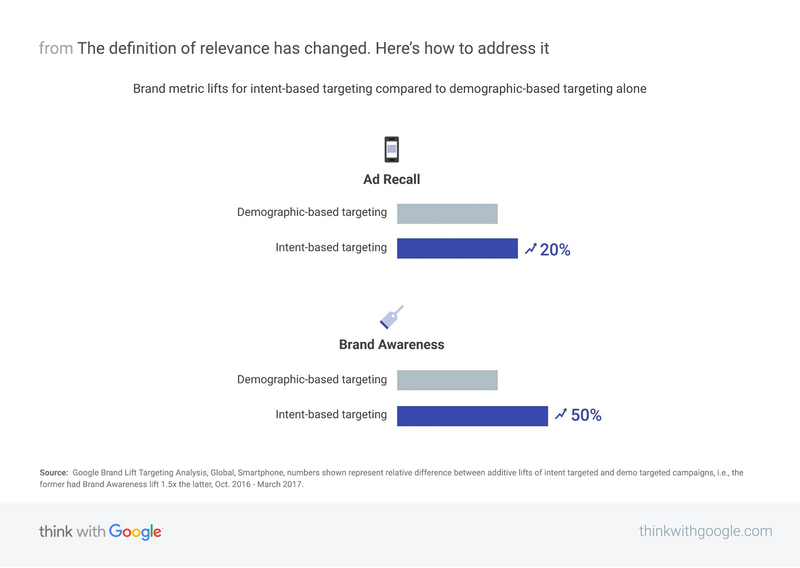 Google Brand Lift Targeting Analysis, Global, Smartphone, numbers shown represent relative difference between additive lifts of intent targeted and demo targeted campaigns, i.e., the former had Brand Awareness lift 1.5x the latter, Oct. 2016 - March 2017. Tools like YouTube’s Director Mix can help solve for this. Director Mix turns brands’ layered files into dozens—or even hundreds—of personalized video ads by swapping images, text, and other video elements, and serving them based on intent signals. 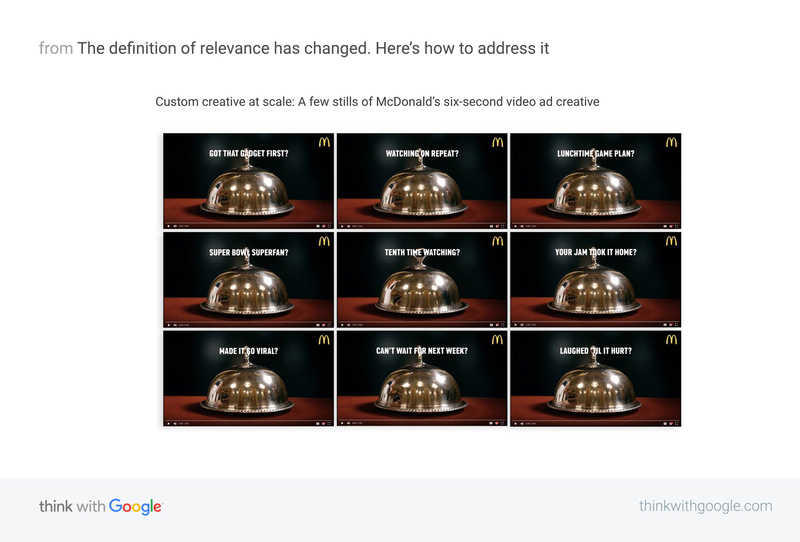 McDonald’s recently used Director Mix to drive relevancy for the Big Mac with millennials. The brand created 77 different six-second ads targeted to its audience’s viewing interests, such as watching a movie trailer or live comedy clip. The customized six-second ads earned more than double the ad recall of the control ads in the campaign. The ability to sequence your messages can be a game-changer for garnering attention. You can pivot, you can react, and you can take consumers down a different path depending on which ads are working for them. For instance, you could start with a fifteen-second TrueView ad to build awareness, continue with another longer spot that communicates product attributes, then follow with a six-second bumper ad to stay top-of-mind and drive to purchase. Ubisoft has experimented with just this kind of ad sequencing to unfold a story to a viewer over time. To drum up excitement for its “Assassin’s Creed” video game among gamers, the team cut several six-second bumper ads from a longer trailer and served them sequentially to core gaming affinity audiences. Ubisoft reached YouTube's mobile-first audience, which was more inclined to watch shorter ads, by unfolding the same story in a way those viewers found appealing. The campaign reached almost 15 million unique users, drove a 25% best-in-class awareness lift, and a 224% search lift for “Assassin’s Creed.” Some of the viewers even went back and engaged with the original trailer. As consumers’ expectations for ads evolve to be more personalized and assistive than ever before, ensuring that your ad campaigns meet the new definition of relevance isn’t just “nice to have.” It’s a marketing imperative. Take advantage of intent signals from search, maps, and apps to go beyond demographics and psychographics. Build sequential stories to get—and keep—attention in every moment. 1 Google/Ipsos, Video Mobile Diary, U.S., 2017, n of 4,381 (saw ads occasions). 2 Google Brand Lift Targeting Analysis, Global, Smartphone, numbers shown represent relative difference between additive lifts of intent targeted and demo targeted campaigns, i.e., the former had Brand Awareness lift 1.5x the latter, Oct. 2016 - March 2017.